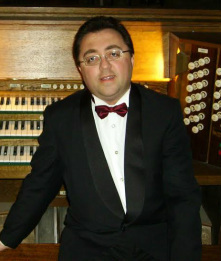 John Aquilina is one of Malta’s leading organists. He has been the Organist at Mdina Cathedral, Malta, since 2001, where he performs regularly. John has been privileged to be mentored by Douglas Haas (Director of Music at St. Andrew's Presbyterian Church, Kitchener, Canada), and the late Nicholas Zelle during their visits to Malta. John has also attended master classes with one of the world’s greatest musicians, French organist and composer, Jean Guillou, in 2009 in France. He has recorded a CD entitled “Organs of Malta” (Ad Vitam Records AVR110415, distributed by Harmonia Mundi) which is the first commercially available CD of the historic organs in Mdina Cathedral and St John’s Co-Cathedral. Other performances can be heard and seen on YouTube or his website: www.johnaquilinaorganist.org. He has also given a number of solo recitals in Malta’s cathedrals and major churches and accompanied choirs in major choral works. John’s musical activities continue to combine the recreation of works in the organ repertoire with the spontaneity of improvisation. In fact, he was the first Maltese organist to have given an entire improvisation concert.